This is a very pretty necklace. It consists of a fine 18ct yellow gold chain suspended from which is an artriculated drop the top of which is an oval moonstone in a rubover setting, below which is a round moonstone in a rubover setting, below which is a large oval moonstone set sideways in a rubber setting followed by a fringe of 3 round moonstones in rubover settings with an oval moonstone in a rubover setting suspended from the middle one. 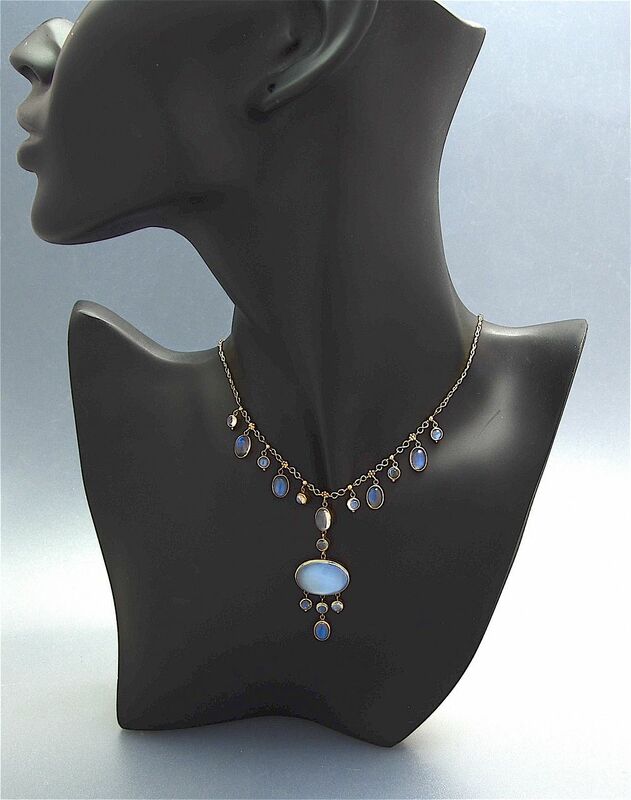 On either side of the central drop are 5 moonstones, 3 round and 2 oval all in rubover settings that are suspended from the chain. At the top of each drop is a small rosette.